Elvis is in the building! 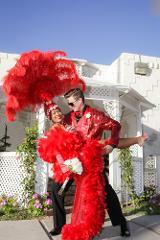 Enjoy a fun tour of Las Vegas and be serenaded with your favorite Elvis songs. At the conclusion of the tour Elvis will bid you a fond farewell as he escorts you back to your hotel. Elvis has not left the building. 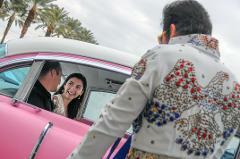 Get married by the King with this popular Las Vegas Elvis Pink Cadillac ceremony that is guaranteed to make memories. 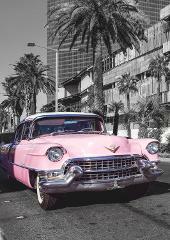 Arrive in style with Round Trip Pink Cadillac Transportation with regular chauffeur for your special event.